This Website of the Blog 7starsdubai.wordpress.com and 7starsdubai.com content still existing media releases and comments from reputated press and websites only. The content of this Website focus to consumer protection for Investors of the Dubai Property market, the UAE and the Middle East. Press Article from the international Press who report about Fraud in relation with Property Investment and Real Estate Developer Investor Disputes in Dubai and the UAE as well reports from the Press about other criiminal acts and Civil Real Estate cases, Lawsuits before the Court in Dubai, the UAE or other countries. Furtheron we show reports about consumer protection and human rights in the Middle East. Actual Topics about the Unrest in Middle East. The information comprised in this section is not, nor is it held out to be, a solicitation of any person to take any form of investment decision. The content of this site does not constitute advice or a recommendation by us.Communications and should not be relied upon in making (or refraining from making) any decision relating to investments or any other matter. You should consult your own independent financial adviser and obtain professional advice before exercising any investment decisions or choices based on information featured in this Web site. We can not be held liable or responsible in any way for any opinions, suggestions, recommendations or comments made by any of the contributors to the various columns on this Web site nor do opinions of contributors necessarily reflect those of us.In no event shall we be liable for any damages whatsoever, including, without limitation, direct, special, indirect, consequential, or incidental damages, or damages for lost profits, loss of revenue, or loss of use, arising out of or related to this Web site or the information contained in it, whether such damages arise in contract, negligence, tort, under statute, in equity, at law or otherwise. Comment Rules: Although the administrators and moderators of 7starsdubai.com will attempt to keep all objectionable comments off this Blog, it is impossible for us to review all comments . All messages express the views of the author, and neither the owners of this Blog, nor the administrator of this Blog will be held responsible for the content of any message, comment. By agreeing to these rules, you warrant that you will not post any messages that are obscene, vulgar, hateful, threatening, or otherwise violative of any laws. The adminstrator of this Blog reserve the right to remove, edit, move or close any comment (message) for any reason This Blog content still existing media releases and comments from websites only. The information comprised in this section is not, nor is it held out to be, a solicitation of any person to take any form of investment decision. The content of this site does not constitute advice or a recommendation by us.Communications and should not be relied upon in making (or refraining from making) any decision relating to investments or any other matter. You should consult your own independent financial adviser and obtain professional advice before exercising any investment decisions or choices based on information featured in this Blog. We can not be held liable or responsible in any way for any opinions, suggestions, recommendations or comments made by any of the contributors to the various columns on this Web site nor do opinions of contributors necessarily reflect those of us.In no event shall we be liable for any damages whatsoever, including, without limitation, direct, special, indirect, consequential, or incidental damages, or damages for lost profits, loss of revenue, or loss of use, arising out of or related to this Web site or the information contained in it, whether such damages arise in contract, negligence, tort, under statute, in equity, at law or otherwise. Copyright: The copyright to the text of the blog is held by the author or link as source provided, where applicable. All images displayed are copyright their respective owners and are used either under licence or under the fair use provisions of international copyright law. The information contained in this Web site is for general guidance on matters of interest only. The application and impact of laws can vary widely based on the specific facts involved. Given the changing nature of laws, rules and regulations, and the inherent hazards of electronic communication, there may be delays, omissions or inaccuracies in information contained in this site. Accordingly, the information on this site is provided with the understanding that the authors and publishers are not herein engaged in rendering legal, accounting, tax, or other professional advice and services. As such, it should not be used as a substitute for consultation with professional accounting, tax, legal or other competent advisers. Before making any decision or taking any action, you should consult the administrator of this website. While we have made every attempt to ensure that the information contained in this site has been obtained from reliable sources, 7starsdubai.com is not responsible for any errors or omissions, or for the results obtained from the use of this information. All information in this site is provided "as is", with no guarantee of completeness, accuracy, timeliness or of the results obtained from the use of this information, and without warranty of any kind, express or implied, including, but not limited to warranties of performance, merchantability and fitness for a particular purpose. 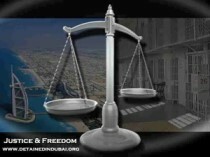 In no event will 7starsdubai its related partnerships or corporations, or the partners, agents or employees thereof be liable to you or anyone else for any decision made or action taken in reliance on the information in this site or for any consequential, special or similar damages, even if advised of the possibility of such damages. Certain links in the Web site connect to other sites maintained by third parties that may or may not be presented within a frame on the Web site. 7starsdubai.com has not verified the contents of such third party sites and does not endorse, warrant, promote or recommend any services or products, that may be provided or accessed through them or any person or body which may provide them. 7starsdubai.com has not issued or caused to be issued any advertisements which may appear on these Web sites. We do not review, monitor or endorse any third party web sites linked to Our Site and We are not responsible for the content of any web site linked to Our Site. Your access to any web site that links to Our Site is at your sole risk. We are not responsible for the information, material, products, or services contained on or accessible through such other web sites and will not be liable for any form of loss or damage arising as a result of or in connection with your visits to such web sites. Any links to other web sites are provided merely for the convenience of the users of this Site and the inclusion of these links does not imply an endorsement of the linked web sites or the content therein. In addition, you agree not to link your web site or any other third party web site to Our Site or frame Our Site as part of any other web site without Our express prior written consent. We reserve the right, at any time and for any reason not prohibited by law, to deny permission to anyone to link a web site to, or frame, Our Site. We reserve the right to withdraw Our consent at any time to a link to, or framing of, Our Site at Our sole discretion without notice. Your use of this Site and the operation of these Terms and Conditions shall be governed by and construed in accordance with the laws and regulations of and applicable in Germany You agree, acknowledge, and submit to the Court in Germany having non-exclusive jurisdiction over all and any dispute or difference between us arising out of or in connection with this Agreement. Please review these Terms and Conditions carefully before using this Site. Your use of this Site indicates your irrevocable agreement to be bound by these Terms and Conditions (as may be amended by Us from time to time). If you do not agree to be bound by these Terms and Conditions please stop accessing and using this Site immediately. Warning: We are aware that several times Cybercriminals mirrowed our Website and posted on several Forums, Website comments by misuse of our email adresses. These Cybercriminals registerd several similar looking Domains and installed several 1:1 mirrowed Websites which look like our Website 7starsdubai. We have already taken the necessary steps by filing criminal complaints against the Individuals behind this Identity theft an Cybercrime, by misusing fraudulently our Blog Identity 7starsdubai. In Search engines like Google, Yahoo, Bling and others you should always take a close view to the links. If this links do not originaly start with www.7starsdubai.com or http://7starsdubai.worpress.com/.... you will end on a faked mirrowed modificated Website. The genral Background of this Cybercriminals is a Stalking and Smear campaign, faking stories for their personal use, to discriminate Persons with the goal to destroy their reputation. The size of the GCC's retail sector is expected to grow from $253.2 billion in 2018 to $308 billion in 2023. Dubai Islamic Economy Development Centre (DIEDC) held a workshop on the ‘Dubai: Capital of Islamic Economy’ strategy. The one-year programme will be conducted by CERT for Certificate in Engineering and Diploma in Process Technology. This abra is the first public marine transit mode powered by solar energy in the Middle East. Deyaar is launching the promotion that covers some of its key residential projects- Midtown, Mont Rose and Ruby Residence. Nexthink signed a partnership with Ingram Micro as a value added distributor for Middle East, Turkey and Africa. Al Khozama management company announces the opening of its first regional office in UAE. The trade mission aimed to familiarize the Chamber with commercial opportunities in Russia’s second largest city. Dubai’s Roads and Transport Authority (RTA) will open the AED 150m ($40.8m) bridge leading to local developer Nakheel’s Deira Islands project next Friday. Guide displays regulatory framework of going public as well as international best practices related to stages of implementation of an IPO. Dubai Future Accelerators redefines public and private sector collaboration in shaping the future. Dubai Future Accelerators program announced five new government entities joining the second cycle of program. Camfil’s air filtration systems to be used in new and existing AURAK buildings. Abu Dhabi Island, Bloom Gardens Phase 3 comprises a total of 147 residential units. The meeting highlighted the need for furthering coordination between committees in a bid to strengthen banking sector. Located on edge of Jumeirah Golf Estates’ Fire golf course, Phase 1 of Redwood Park comprises of three- and four- bedroom townhouses. Voxin (Levofloxacin) is a fluoroquinolone antibiotic for treatment of lower respiratory tract infections and sinusitis in adult patients. Roads and Transport Authority (RTA) will open this Friday the bridge leading to Deira Islands Project. Theluxurycloset.com has launched an app to complement its existing e-commerce platform. The deal encompasses Majid Al Futtaim's exclusive distribution rights in UAE, Saudi, Kuwait, Qatar, Bahrain and Oman. Sheikh Mohammed highlighted the importance of the historic and strategic trade relations between China and the UAE. Sheikh Mohammed has assigned four ministers to carry out the functions of the newly launched Ministry of Possibilities. The driver jumped the red signal. Her picture has been liked over 300,000 times on Twitter. She stabbed him in the heart for refusing to do homework. She was crying outside the Dubai court when they approached her. He faces a maximum penalty of 14 years in prison. According to a leaked security document, Catholic churches and other denominations are seen as a major target for attackers. She was reaching for something in the grinder. Officials believe the fire was possibly caused by a short circuit linked to renovation work underway before the fire. Her clients included Angelina Jolie, Tom Cruise, and Robert De Niro. The video went viral after social media users slammed Khan for his statement. Sheikh Mohammed joined 40 state leaders and delegations from 150 countries. Religious leaders cancelled public prayer gatherings amid warnings of such attacks. Tents will also be open during Eid El Fitr. He changed the date of an expired ticket. In a show of strength, he had held a mega roadshow in the city. In the video, we can see pilots trying to control the aircraft. If a person has defaulted on a loan amount below Dh50,000, the lender can lodge a civil complaint. Other iconic landmarks in the UAE also paid tribute to the victims of the Easter attacks. exceptional black outside table and chairs black gloss table and chair sets. . . . . . . . . . . . . . .
awful proper way to hang curtains how to hang curtains with rings. . . . . . . . . . . . . . .
amazing 3 bedroom house for sale in toronto canada 3 bedroom house price in canada toronto. . . . . . . . . . . . . . .
astounding funky bedroom furniture funky childrens bedroom furniture. . . . . . . . . . . . . . .
excellent easy chair cover pattern easy dining chair cover pattern. . . . . . . . . . . . . . .
impressive 24 inch white vanity with drawers 24 inch white vanity with drawers. . . . . . . . . . . . . . .
fearsome disney pixar cars recliner chair furniture stores. . . . . . . . . . . . . . .
formidable 2 bedroom apartments naperville il 2 bedroom apartments near naperville il. . . . . . . . . . . . . . .
phenomenal mens black bedroom furniture furniture stores near me open on sunday. . . . . . . . . . . . . . .
dreaded kraus black kitchen sink kitchen sink plumbing. . . . . . . . . . . . . . .
Dubai – The case of Bin Gaith and four others returned to court Sunday in Abu Dhabi, where they face accusations of threatening the UAE’s stability by joining Internet campaigns calling for a greater public voice in the country’s affairs. The 42-year-old Emirati, a decorated former air force pilot who holds degrees in law and international trade, comes from a prominent Dubai family with a long history of serving its rulers. He’s lectured at one of the country’s showcase institutions, the Abu Dhabi branch of Paris’ Sorbonne university, and worked as a legal adviser for the Emirates’ armed forces. Yet the United Arab Emirates now considers him a potential enemy of the state. The five activists – jailed since April – boycotted the session as part of demands for bail and to protest their treatement as alleged state security risks. .For the first time, however, authorities opened the previously closed-door hearings to the public. The police officer in charge of bringing the five defendants to the hearing told the State Security Court that they “refused to come,” without any further explanation, an AFP reporter said. One of their lawyers, Mohamed al-Roken, told the court that the defendants accused of insulting top United Arab Emirates officials refused to attend the hearing after their demands were not met. The five men, four of whom are Emirati and one stateless, are demanding to “obtain all documents related to the trial, allow the defence to question all witnesses,” as well as an “end to their ill-treatment,” Roken told the court. In court Sunday, prosecutors played a video montage of patriotic images – including the UAE’s founder Sheik Zayed bin Sultan Al Nayhan – in an apparent attempt to mock the activists’ calls for reforms. On April 17, bin Gaith’s regular column ran in an Abu Dhabi financial paper, Roayam Iqtisadiyya. Students at the Sorbonne were in class, waiting for bin Gaith to give one of the last classes before exams. He never showed up. A day earlier, state security agents lured him from his Dubai villa to Abu Dhabi, the capital, and arrested him on the spot, his family said.